Kickstart your summer fun with Tie-Dye Shirts for the whole gang. 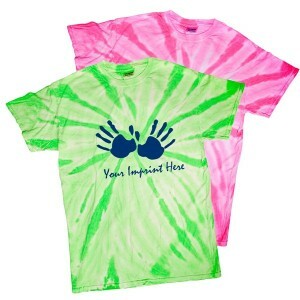 Start with T-shirts imprinted with your school or group name or logo, then get creative with tie-dye for unique group shirts. These work great for summer camps, activity groups, teams or school groups. Kids can get wildly creative with their designs, while the whole group still has unity. Make them for field trips, lock-ins, track and field days, sporting events, dances or activity days. Begin by twisting and rubber banding your shirt. Start with a lightly damp shirt. There are many variations and kids can get creative and design their own patterns. Coins or marbles can be added for unique designs. Prepare dye according to package directions. Use as many colors as you like, setting up each color in a separate bin or bucket. Rubber gloves will protect your hands from stains. Once your garment is ready, place in the dye for at least 15-20 minutes. The longer the garment remains in the dye, the darker and deeper the color will become. If using multiple colors on the shirt, you can dip portions and hold them in the dye for 15 minutes, or you can use squeeze bottles or spray bottles of dye and apply directly to the shirt in areas of desired color. . Remove from the dye and rinse according to package directions, usually in cold running water. Ring out garment until water runs clear. Carefully remove rubber bands and marbles to reveal your new design! Hang to dry. 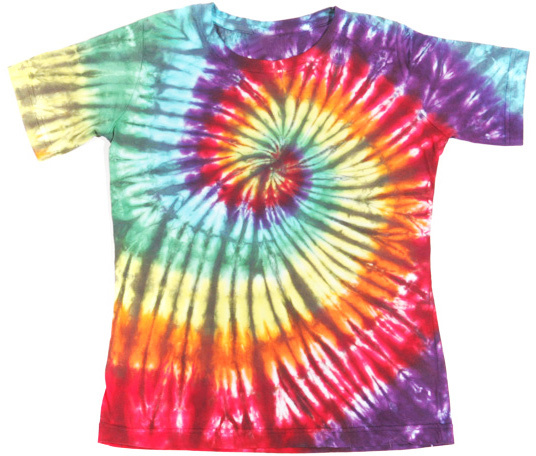 Do you have any tips for tie dying shirts?